The idea for what is today the Society of Police Futurists International (PFI), dates back to the early 1980s. 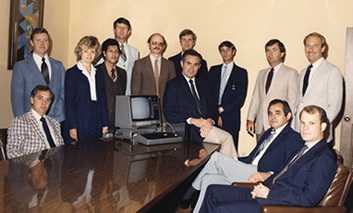 In 1982, "Futuristics in Law Enforcement," developed and taught by then-FBI Supervisory Special Agent William L. Tafoya, was first offered as an elective graduate course in the National Academy (NA) Program at the FBI Academy in Quantico, VA. In April of 1991, 60 educators joined 250 graduates of the NA “Futuristics” course from around the world to participate in the first "International Symposium on the Future of Law Enforcement.” The theme of this 5-day event was "PowerShift," in honor of the symposium's opening day keynote speaker - noted social commentator, acclaimed author, and renowned futurist, Alvin Toffler (right). Bill Tafoya's concept of more than a decade earlier, took root and was discussed in the concluding days of this meeting. The delegates voted to begin a professional association dedicated to the future of policing. A steering committee was selected from the delegates to develop a constitution, bylaws, and membership criteria for this new professional organization. PFI was officially constituted in August of 1991. Charter membership in this unique organization was originally offered exclusively to those who had attended the 1991 symposium. It is important to note that, were it not for the generous support provided by Westinghouse Electric Corporation, PFI might not exist today. Joanne Gasper, at the prompting of original steering committee member (and subsequent PFI President) Dan Arkenau, was the visionary who persuaded Westinghouse to contribute the "seed money" crucial to getting PFI off the ground. Westinghouse also went on to sponsor PFI's first symposium in May of 1993 in Baltimore, MD, published the first several issues of the organization’s newsletter, and served as the Secretariat (administrative office) for PFI until March of 1994. The Society is indebted to and gratefully acknowledges the invaluable assistance of the Westinghouse Electric Corporation in launching PFI. "Futuristics and Law Enforcement: Foreseeing, Managing and Creating the 21st Century," was reintroduced into the FBI Academy curriculum in 1999 by FBI Supervisory Special Agent Carl Jensen. In the fall of that year, the instructional personnel of the Behavioral Science Unit of the FBI Academy began an ongoing dialogue with PFI members. That dialogue has evolved into a collaborative relationship that capitalizes on the strengths of each organization. In July of 2000, SSA Jensen coordinated another symposium - the 5-day "Futuristics and Law Enforcement: The Millennium Conference" at the FBI Academy. Some of the same speakers and delegates who participated in the original 1991 symposium attended this most recent conference as well. The tragedy of September 11, 2001 served to be the final catalyst for the formal creation of a Futures Working Group, designed to assist law enforcement in dealing with the issues that will confront public safety in the coming decades, and solidifying the relationship between the FBI and PFI. 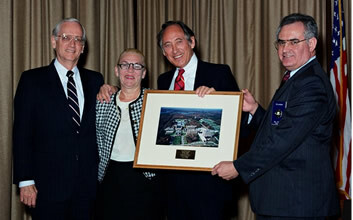 FBI Director William Sessions congratulates Heidi & Alvin Toffler, Keynote speakers at the 1991 International Symposium on the Future of Law Enforcement as symposium coordinator, Supervisory Special Agent William L. Tafoya looks on. As the organization has evolved, so too have the criteria for admission. Membership is open not only to graduates of the Futuristics course at the FBI Academy, but also to other professionals interested in the future of law enforcement.